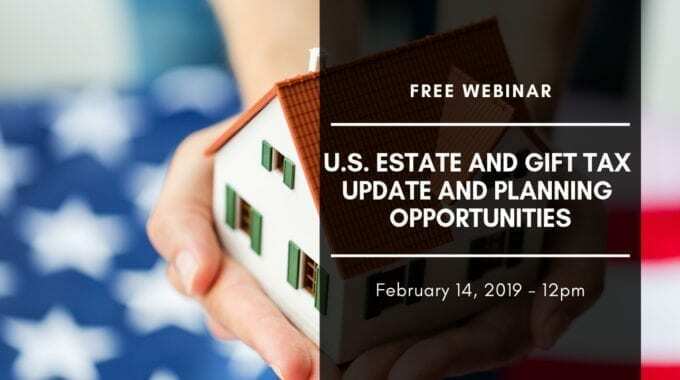 On February 14, 2019 at 12:00pm (Eastern Time), join us for a free webinar with U.S. tax attorney Alexey Manasuev, LL.M. (Int’l Tax), NYU, TEP, and U.S. tax accountant Brandon Vucen, CPA, CA, CPA (IL), MST, and U.S. and Canadian attorney, Jory Stern, B.A., J.D., who will discuss U.S. estate and gift tax developments relevant to the 2018 tax season, including key tax compliance considerations and planning opportunities lying ahead. U.S. and foreign taxpayers may be subject to the U.S. estate or gift tax when they enter into certain transactions, some of which may lead to adverse income and estate and gift tax consequences. Notwithstanding a high basic exclusion amount, traps for the unwary exist. Understanding the applicable framework, being proactive and planning ahead of time provides a significant level of certainty and advantage to taxpayers. Estate planning has always been an important area for planners and tax professionals. To learn more, please register and gain the knowledge you need to understand the new law and help your clients effectively plan for their future. We hope you join us!